Ray Fogg Corporate Properties, LLC has entered into an agreement with BH (Ohio) Leasing, LLC (an affiliate of Brennan Holdings, LLC) to begin development of land strategically located at the intersection of Route 8 and Seasons Road in Stow, Ohio. The development has been branded Seasons Business Park. The first phase of the park will consist of 45 acres at the southeast corner of the freeway interchange. 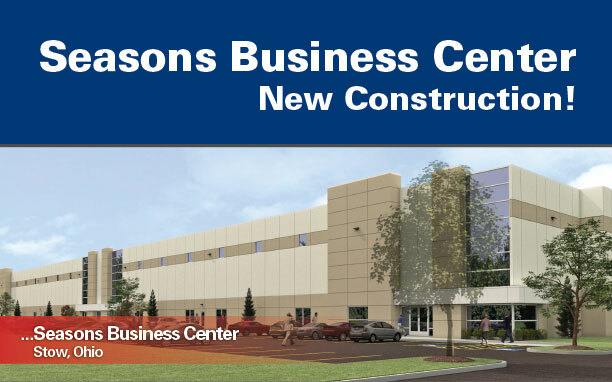 To get things rolling, a Brennan/Fogg joint venture will commence construction of Seasons Business Center, a speculative 108,000 square foot high bay industrial building. The facility will feature clear heights of 32 feet, ESFR sprinklers, abundant truck access and office floor plans to suit. The building will be ready for occupancy as early as this fall. The partnership is big news for the northeast Ohio real estate market, because it pairs Ray Fogg, one of the area’s premier industrial developers, with David Brennan, one of the area’s prolific entrepreneurs and real estate holders. A year ago, Fogg helped lead the local industrial market out of the recent slow-down by developing one of the first industrial speculative buildings to be constructed for in many years in Northeast Ohio (Bluestone Business Center), and achieving 100% occupancy. Brennan has been a leader for many years in industries ranging from legal, manufacturing, education and real estate. Equally big news is the development itself, which opens up a significant amount of prime industrial and commercial land at a very convenient freeway interchange. Well located in northern Summit County, the four-way Route 8 interchange provides easy access to the Ohio Turnpike (I-80), I-271, I-480, Akron and Cleveland. In addition to its favorable location, the development will benefit from tax abatement and other incentives offered by the City of Stow, which strongly supports economic development and its business community.